It’s been several years since our last visit to Mohican State Park. The park is known for it’s heavily wooded rolling hills of white pine and hemlock which are not found in most parts of the state. 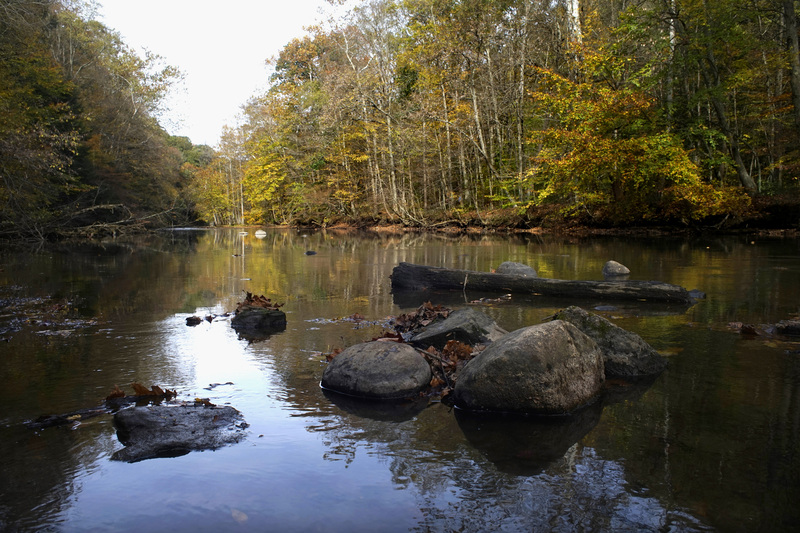 With a good forecast for the day, followed by what appeared to be days of colder, wetter than normal weather, we decided to forgo our usual Saturday bike ride in favor of a scenic autumn drive to Ashland county and a hike along the Mohican River. As we headed to the northeast on some of Ohio’s most scenic back roads there were nice areas of color in the rolling hills near the park but closer to Columbus the land, mostly consisting of already harvested farm fields, is much flatter so the “autumnal splendor” was a little underwhelming. 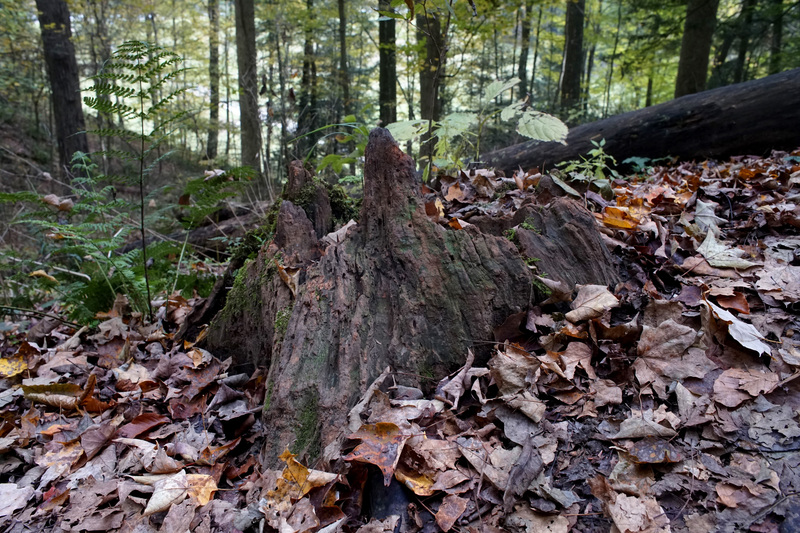 Nonetheless, once on the trail, we were rewarded with some nice views and, as always, some unexpected discoveries. 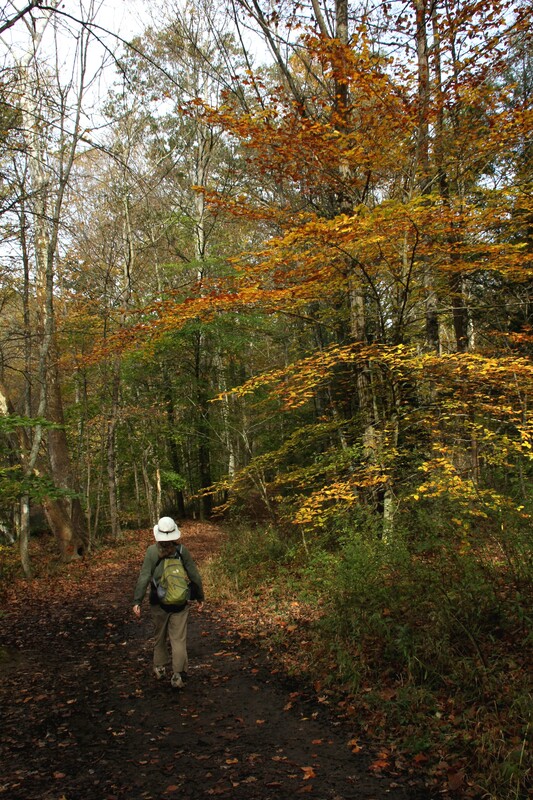 The trail that took us along the river meandered through woods of hemlock and beech. 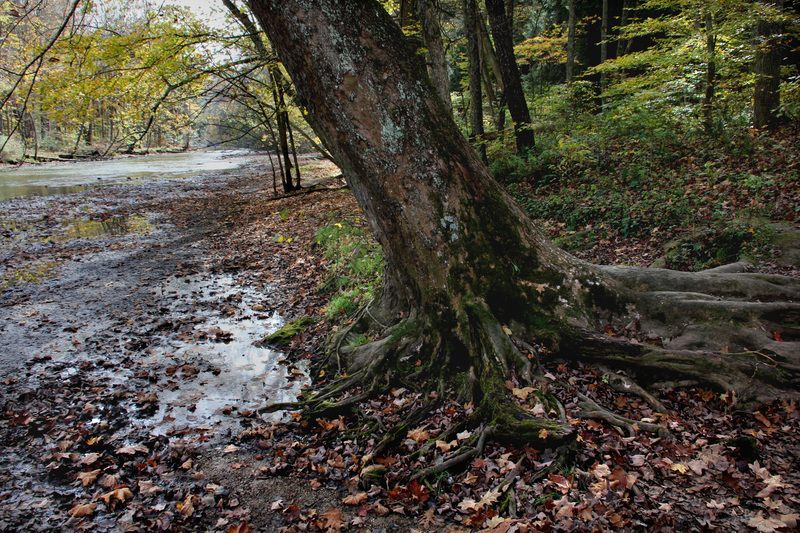 Fallen leaves and tree roots at water’s edge. 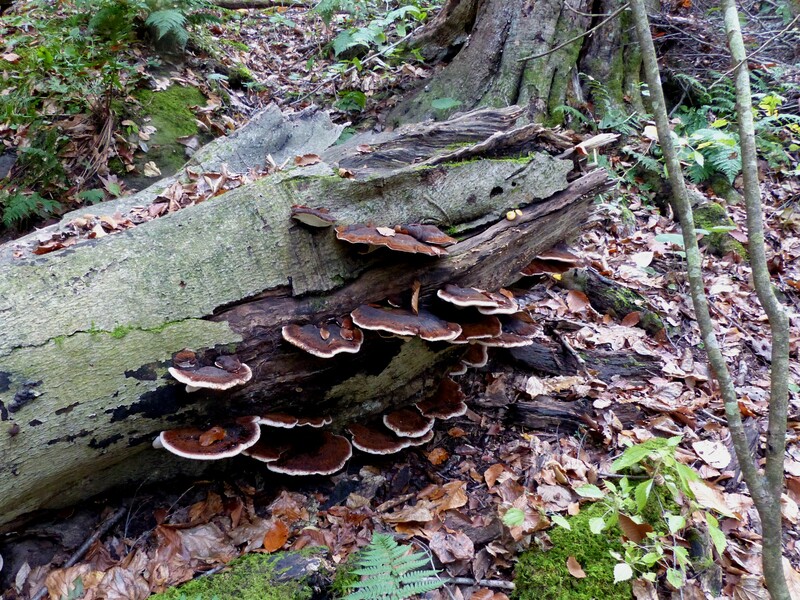 Among numerous fallen and decaying trees there was plenty of fungi to fascinate. 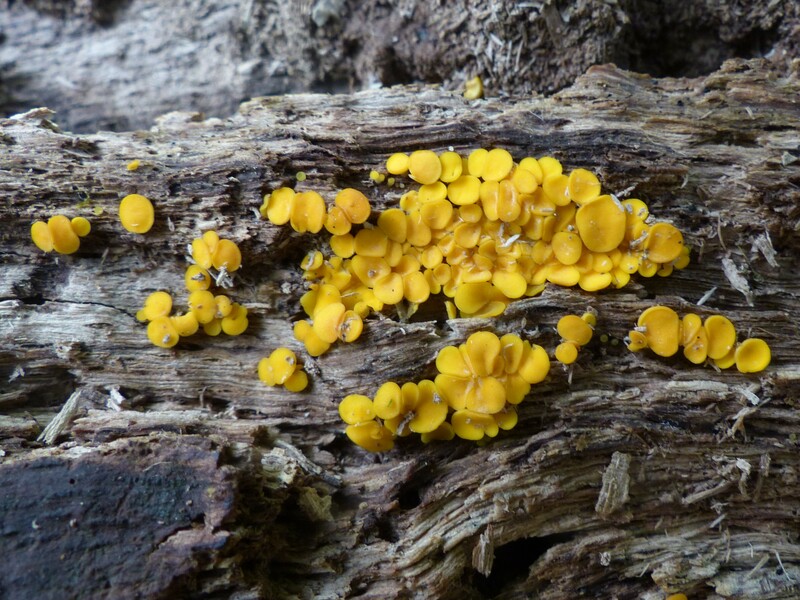 Extremely small Yellow Fairy Cups, (Donna). 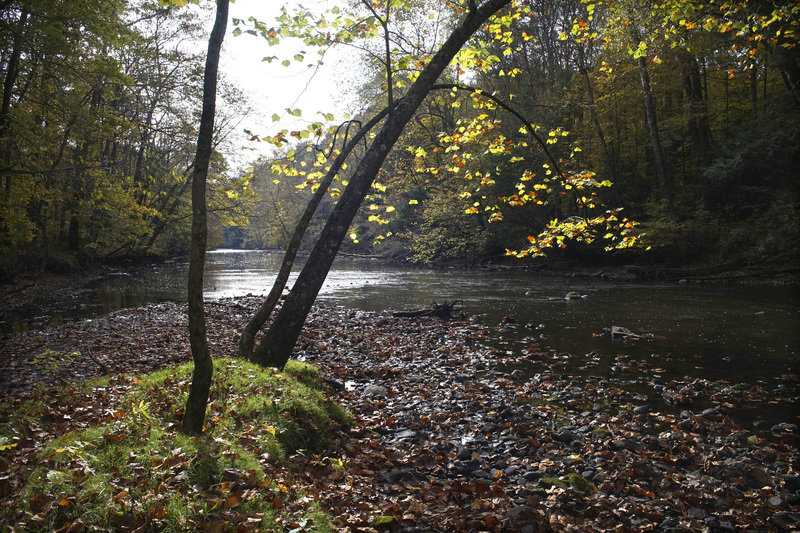 A low autumn sun illuminates the river. Winter Wrens, chickadees, nuthatches, and downy woodpeckers entertained us along the trail. Unfortunately, low light, and birds that were very active, conspired against photographs. However, a few insects did pose for the camera. 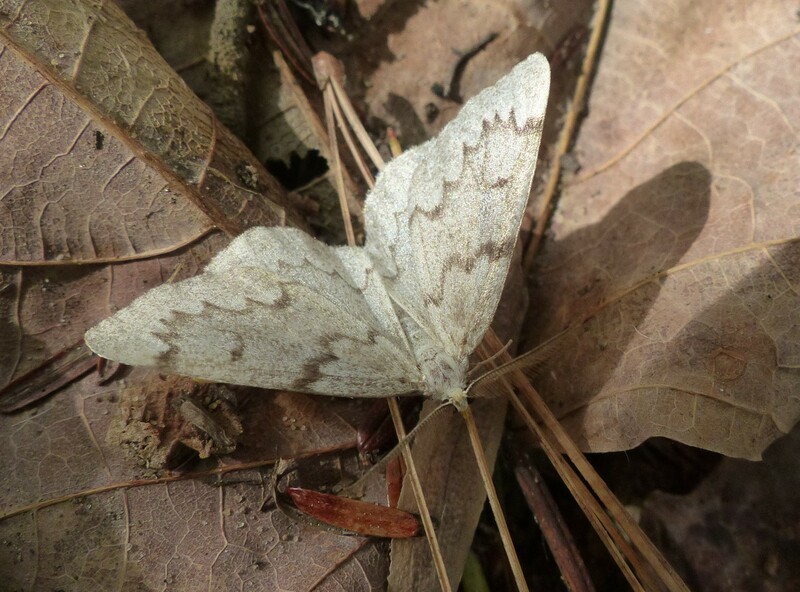 False Hemlock Looper Moth, (Donna). A real treat was seeing liverwort on the rocks at various locations along the trail. Areas usually visited closer to home lack the rock formations on which it’s typically found. “Liverworts are of more than 9,000 species of small non-vascular spore-producing plants. 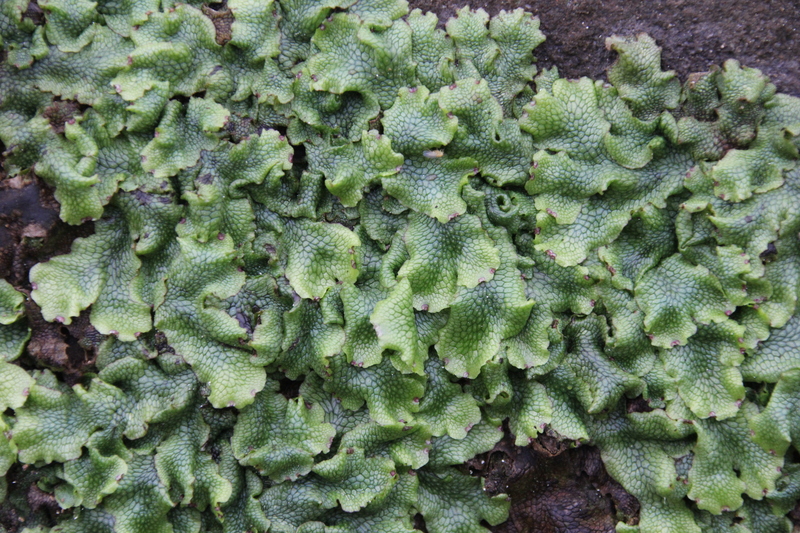 Liverworts are distributed worldwide, though most commonly in the tropics. Thallose liverworts, which are branching and ribbonlike, grow commonly on moist soil or damp rocks. 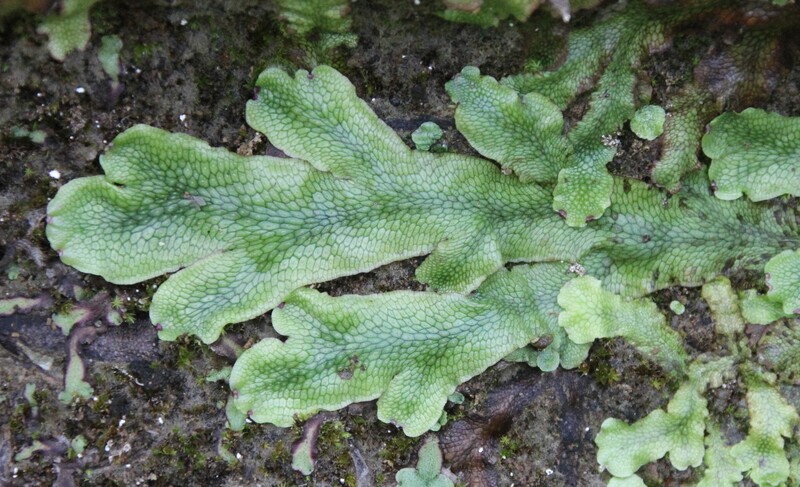 The thallus (body) of thallose liverworts resembles a lobed liver—hence the common name liverwort (“liver plant”).”, Ref: Encyclopedia Britannica. 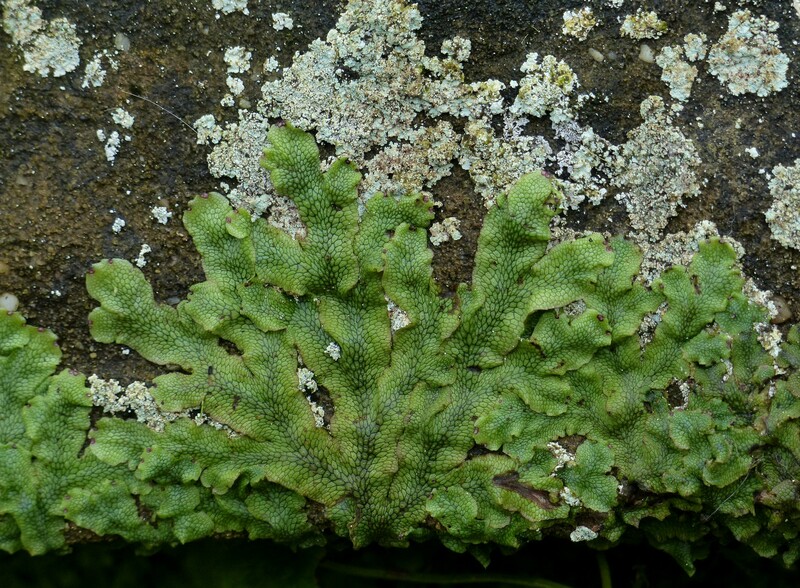 Liverworts represent some of the earliest land plants. 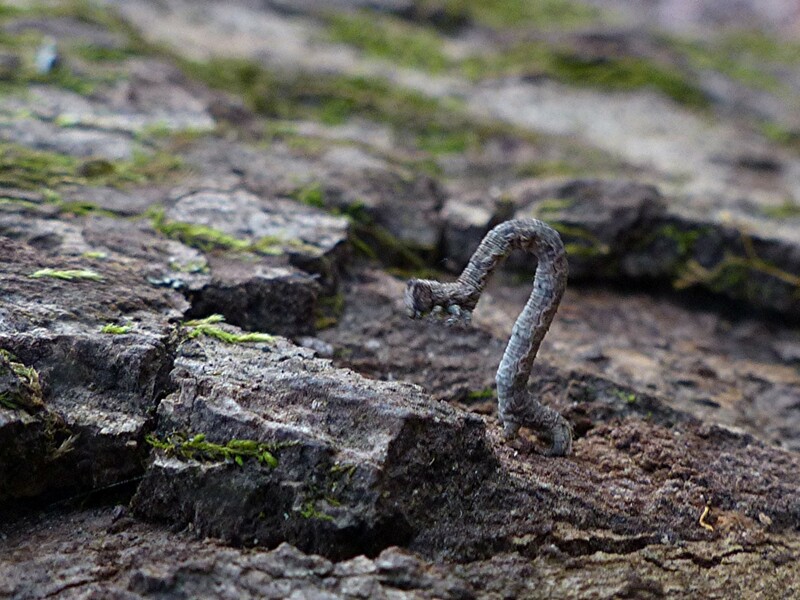 “Five different types of fossilized liverwort spores were found in Argentina, dating to the Middle Ordovician Period, around 470 million years ago”. Ref:, Wikipedia. Due to recent dry weather, Big Lyons falls was just a trickle and too small to capture in a photograph. However, the area immediately around it was beautiful. 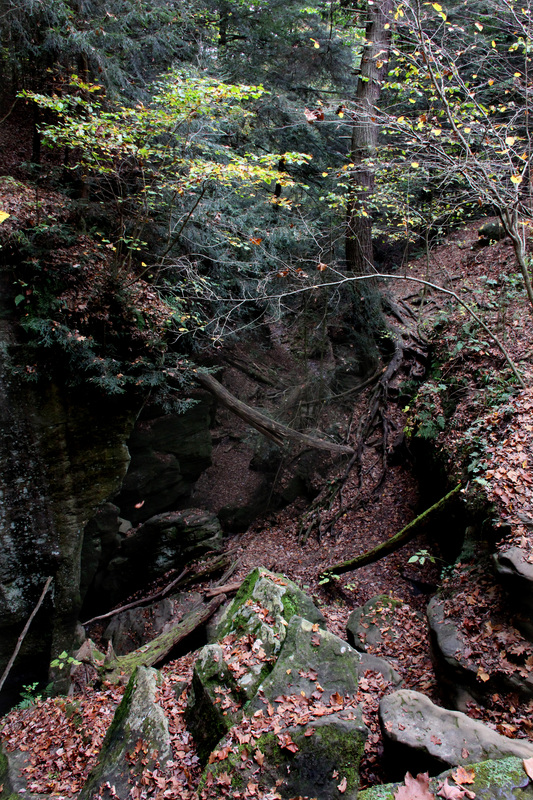 The narrow gorge near Big Lyons Falls. 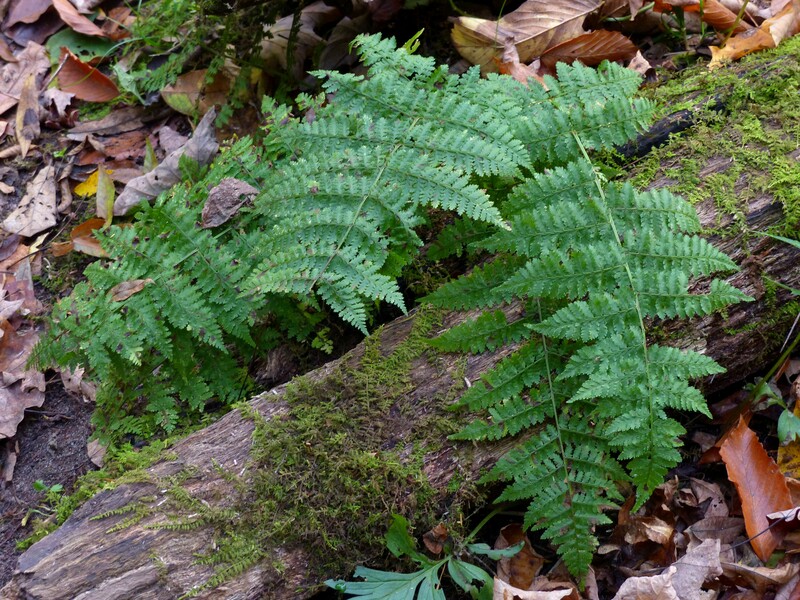 While ferns are certainly not rare closer to home, we were surprised by the number seen in the woods of Mohican State Park. The below ID represents our best guess for one of the more common ferns seen. Since our trip just a few days ago fall color has continued to develop in the residential neighborhoods near our home. Particularly beautiful have been the reds of various maples planted by homeowners. In rural Ohio maples do not occur naturally in any appreciable number so colors are typically more muted. Hopefully that is not the case where you are. During this magical time of year we hope you have an opportunity to spend time in nature and that when doing so you are blessed with an autumn graced with the color of maples. Thanks for stopping by. 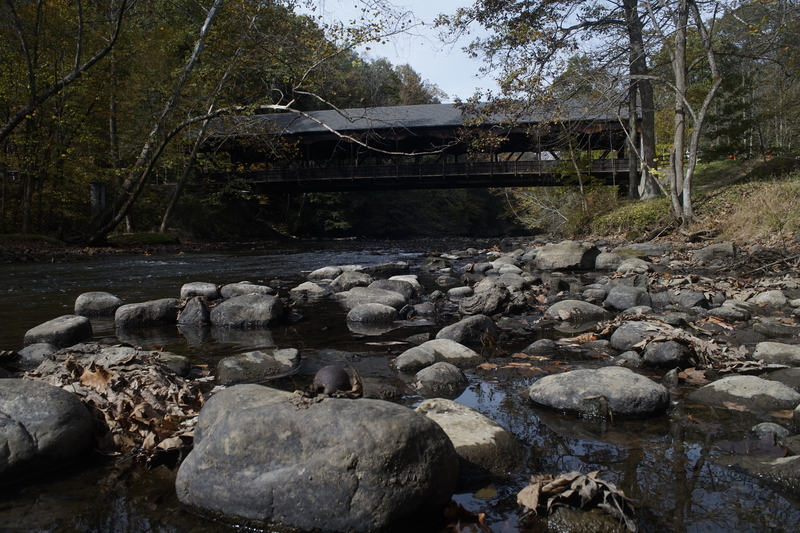 Covered bridge over the Mohican River. Thanks Jim, it’s always fun putting these post together. I hope you had a chance to smell the great scented liverworts. They have a very fresh, clean scent that is always surprising. We will have to make a point to check out the scent next time we find some. 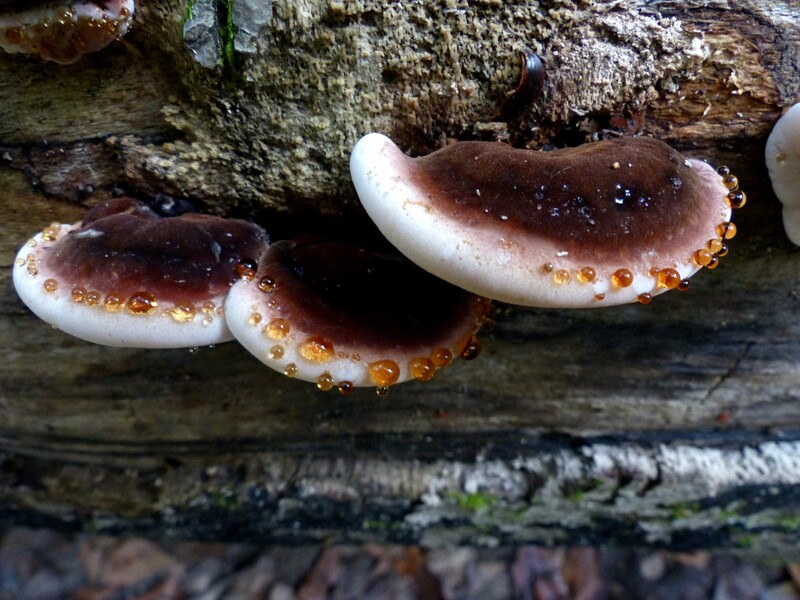 The fungus was very good. 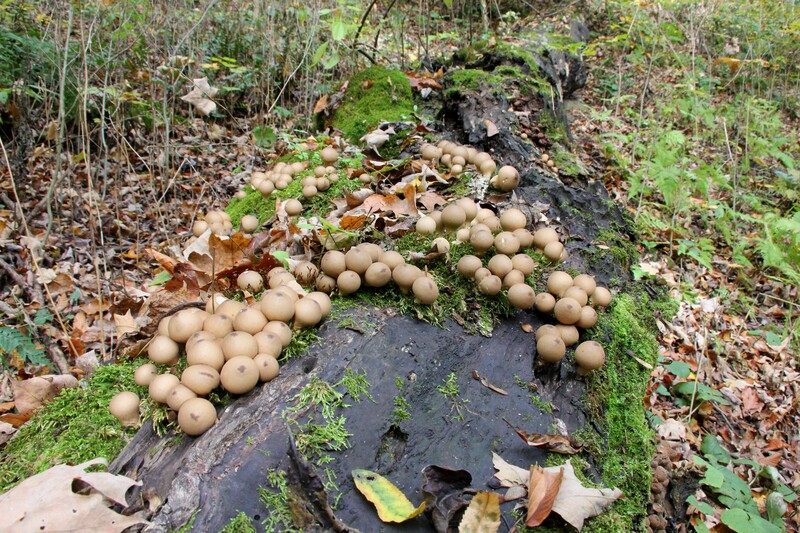 I am disappointed by the fungus here this year. I will have to look harder. Beautiful pictures as usual. 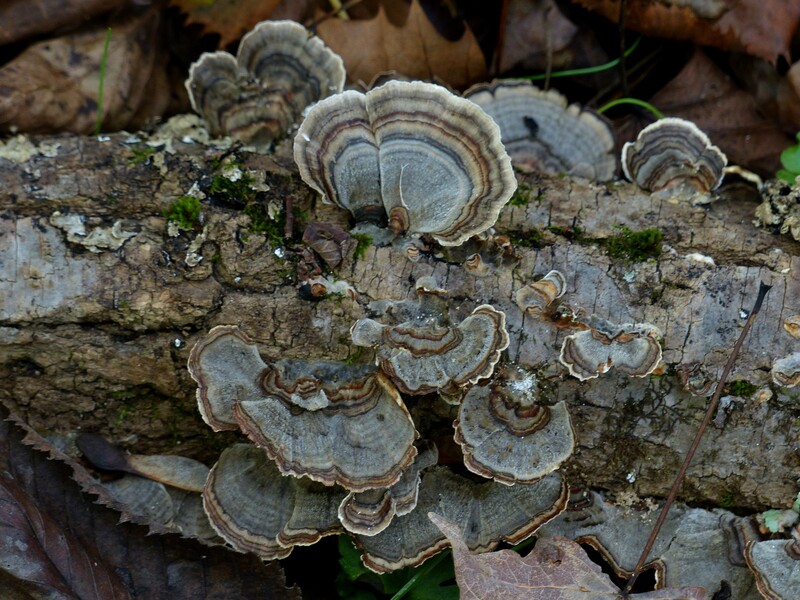 I particularly liked the ‘drops of honey’ on the bracket fungus. I have seen something similar where I live. I also loved the liverwort images – great detail in an often overlooked organism.